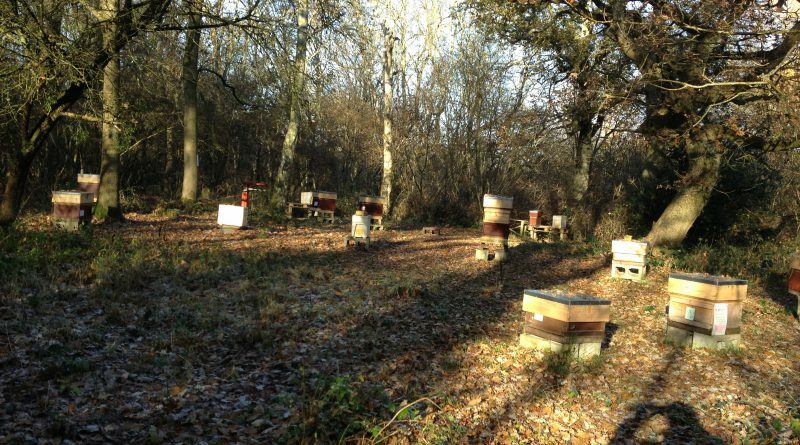 As the cold and frosts of winter start to creep in the colonies will form their clusters in the hive and the Queen will stop laying or reduce it to very small numbers. If they are well fed, weatherproof and protected from predators leave them well alone to survive the winter storms> You just need to ensure roofs have not blown off or become dislodged. During milder weather you may notice hives throwing out their dead and those deformed bees with DWV or other afflictions. DWV is of course linked to the Varroa parasite and the horrible viruses it transmits when feeding off the live Bees. You may choose to leave your Varroa screens in place during the winter and every now and then check to see what has dropped on the floor. This debris can be a good indicator that all is well in the colony. 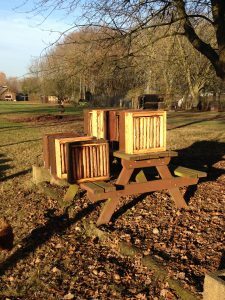 You will be surprised what is thrown out of the hive by the bees during the winter months as they don’t fly far, if at all, with any rubbish or dead bodies they remove when they have a clear out. A good idea is to use old carpet tiles ( skips good place to find these) on the ground at the front of the hives so you can see what debris is disposed of. It is also a good place for returning bees to land (collapse) if they don’t make it back to the landing board through the chicken wire. Those of you who live near urban environments will be amazed by what pollen they bring in on warm days well into December as some gardens and Green houses have exotic flowers in full bloom. 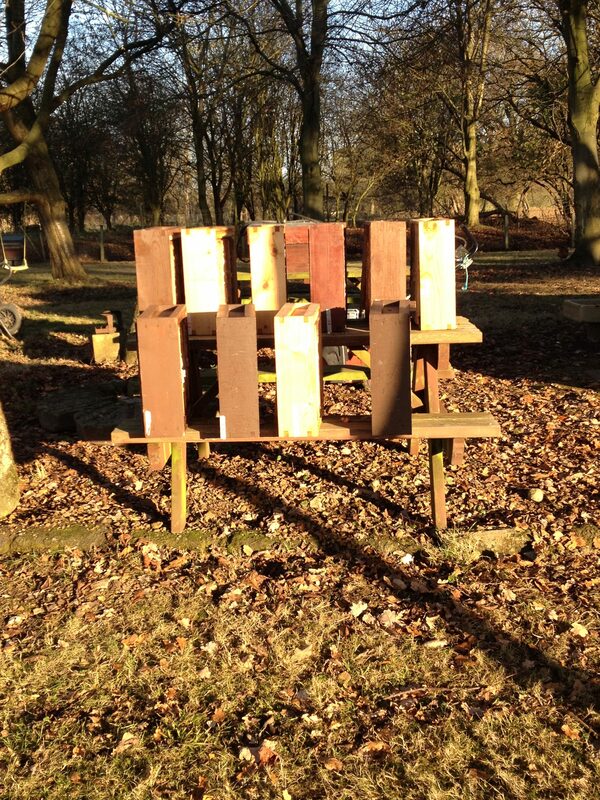 Whilst we have short but cold hours of daylight it is a good time to sort out all that old comb or capping you have stored away in the Bee Shed or other location unbeknown to your family and friends! One of our members has an home built steam cleaner using an old wall paper stripper (instructions in another article) which is used to cook old frames and wax and is a first stage of recycling and cleaning. Once steamed the dirty wax is put into a Muslin bag or old pillow case (charity shop don’t use your own) and re-steam until it comes out into old ice cream tubs a nice yellow colour. It is then all ready for exchanging for new Foundation at the Spring Convention at Stoneleigh. It is always best to deal with old comb and wax at this time of year (unless you have a well sealed solar wax extractor.) as there are no bees or wasps are flying to be attracted to you activities. Those SBKA member who recently went on a Skep making course could of course finish making our part constructed Skep ready for the competition in next years Honey Show!!!! The last bit of advice I have for this month is to get all your unused brood chambers and supers out of the shed or where ever you have stacked and stored them for the winter and let one nights hard frost get at the combs. This will kill any Wax Moth, Queen wasps and other insects hibernating in your stored combs before you store them away before the bees and mice (metal Queen excluder top and bottom of the stack) find them as the weather warms up. Merry Christmas if you are reading this before santa arrives!! !